The reasoning behind a) is that the PVC cracks in the sun allowing water to sit inside the PVC against the wire and eventually it rusts and snaps when the crew are hiking out. This is not only unsafe but it will slow you down and you probably won’t finish the race! b) Grade 316 stainless wire is recommended. When using spectra to attach the lifelines I don’t just put the line through the ‘loop’ that is spot welding on the main pulpit/pushpit tube. I figure of 8 the line going through the loop around the pushpit through the loop and back to the eye in the lifeline. That way I am not relying on the spot welding on the pushpit/pulpit. c) A taut lanyard of synthetic rope may be used to secure lifelines provided the gap it closes does not exceed 100 mm (4 in). d) All wire, fittings, anchorage points, fixtures and lanyards shall comprise a lifeline enclosure system which has at all points at least the breaking strength of the required lifeline wire. In Seahorse on the RORC club page the skipper of Holligan V described how difficult it was to access the liferaft when their yacht capsized. Some key lessons learnt from this experience. * all crew should carry knives and small waterproof torches as a matter of course. * liferaft stowage should be reviewed. Ours was accessible with the boat upside down. The four survivors would not be around if our raft had been safely stored in the locker. Also attaching the liferaft with a hydrostatic release would be a lot safer. point on board the yacht. Good thing you are small! 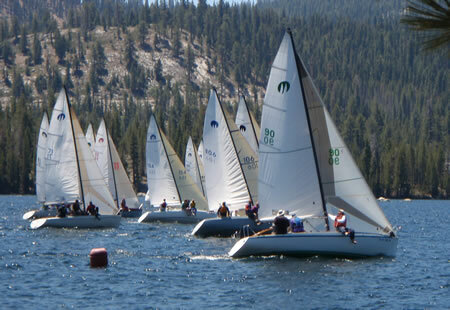 At the weekend I joined another Moore 24 crew for a regatta at Huntington Lake. My normal crew was busy so I decided to go as foredeck with Numa Boa 106. It is a long drive to Huntingon especially when you fight friday traffic out of the city so after getting lost going the locals way we finally got there at around 10pm. The rest of the crew had taken friday off and gone up on thursday with the boat. They had the campsite all set up and a delicous meal of potatoes, corn and steaks ready for us when we arrived. They had even caught some trout from the lake and cooked that up on a roaring campfire. Stupidly I forgot a flashlight – not sure how I did that – however putting up my tent was not that hard as it is pretty simple and I had thankfully left it packed in a way that made it plug and play. The guys continued to party till 2:45 in the morning I decided to hit the hay around midnight. In the morning I woke to find that we were camping right on the lake shore. On Saturday we had to put the rudder in the boat and attach our ‘borrowed’ tiller as the boats carbon one had gone missing. 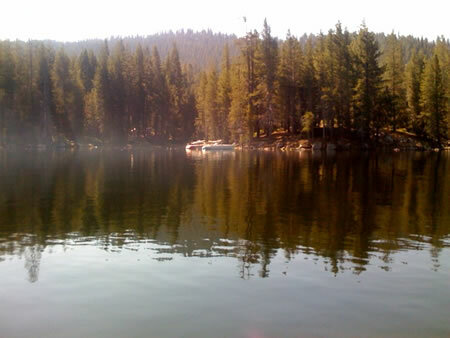 We launched the boat and went back to the campsite for breakfast. This is a relaxing regatta with 11:30 starts and short races in beautiful mountain scenery. We had three races on Saturday and our guest sailor was Gilles’s (one of the owners) girlfriend Sally who did a great job slithering under the boom vang. Sailing a Moore with 5 people is squashed. Our first race was not stellar but Mark (other owner) pulled off some great starts and race 2 we got the best result they have had in 8 years of a 3rd finishing overlapped with 2nd and 4th. Dinner on Saturday was chicken which had been marinated all day in orange vitamen water (for that citrus flavour) and soy sauce. As we left the campsite to go to the bar thinking we would find Moore sailors we were slightly blocked in but Gilles managed to sneak the car through the space to which the women blocking said ‘good thing you are small’ which due to Gilles stature and the whole timing led to peels of laughter from within our car. In fact I have to say the Numa Boa crew is the most caveman like crew I have sailed with in a long time with no pretense at being the least bit refined! The jokes were like preschool full of toliet humor and there was a lot of sticking things up orifices if people didn’t shut up! It became a who can shock Ashley the most I think. However, with Sally and Anne Marie there the girls tried valiently to fight back and clean up the conversation – really to no avail. Sunday we changed the rig tune a little. Gilles and I decided that both of our boats were examples of the cobblers shoes – with plenty of things needing fixing. Gilles has a business rigging in the bay and he is very good at it. Our other crew was Andy who has been on the Moneypenny program for the last few years and just returned to the Bay. It was a great crew to be sailing with as no one had to be coached. Gilles drove on Sunday and we lined up with the top boats for some speed testing before the start bouying our confidence by staying with both of them straight line. On the first race of the day we were in second place for most of the race getting a great start at the boat (shore) and getting every shift, with great height and speed. Downwind the fleet compressed as the wind came in from the back but we held second till right at the mark rounding when we had to let someone inside as they got an overlap on the last surf. From then on it was a reach then a short downwind then a short upwind. Unfortunately there was a little melt down on the boat due to the over excitement of our unusual position of being so far up in the fleet and we lost 3 boats at the end resulting in a 5th. A shame as a second was accessible for us and very possible. The last race saw the boat leading the regatta retire as they had won without sailing the last race and our first start was very good however the rest of the fleet was general recalled. Unfortunately our start wasn’t great and we played catch up from there. Gilles and Andy were staying Sunday night so lucky Mark and I were able to tie the boat to the dock and get on the road home. A very enjoyable weekend with some really fun competitive sailing, good food and beautiful scenery. In Seahorse RORC Club page pyrotechnics were discussed…. The brightness of white flares varies significantly the best giving off 10K candela and the worst 2.5K. The only way to find out the candela is to check the manufactuere’s data sheet as it is not on the flare container. During the Holligan V incident a wave dropped into the flare container which promptly sand along with the rest of the flares. A suggestion is to store them in a buoyant container. Also it was noted that flares have different ignition systems which are hard to read in the dark when in the water. The storage of flares needs to be accessible so that in the case of a capsize they are very easy to find. This inhauler is a simple sailmakers thimbel with a stainless bar tack welded to seperate the jib sheet from the inhauler. The edges are padded to stop any damage to the gel coat on the coach roof. 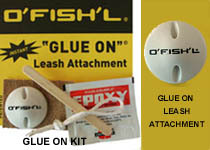 I use padeyes from O’fishl and glue them on to the hull with 5200 you can also use thickened epoxy. A simple and quick way to comply with the rule. After a lot of work to get the Quest 33 ready for Cat 2 racing Wayne the owner of the Quest 33 RYM is looking after lent us the boat for Coastal Cup. With a crew of 4 – Mark English (Moore 24 owner), Richard Leslie (Melges 32 owner), Olivier Lapparra and myself set off hoping all the forecasts were wrong. We didn’t have a good start – second row and very slow. There was a large ebb and we were well clear of the line for the start of Class A. So with a no wind and a rolling start sequence it took us 5 minutes to get to the line and I squeezed up between the J109 and the anchor rode of the start boat – they were kind to let us in was cheeky for us to go in there but with both of us moving at 1.5 knots it wasn’t in his interest to punch it up and push us out. We tacked straight away so as not to sit on their wind and also because although the most ebb was on the city front it looked very slow going that way. We ended up tacking up to the bridge between Angel and Treasure cutting across to the city front around Blackhaller and then heading out very close to the south tower and working middle to left side outside the bridge. There was a very light NW at this point and we started reaching south at about 200 so that we didn’t close on the coast as per Commanders suggestion of keeping offshore. All the other boats started to hoist their kites but weren’t even making it around Point Montara so we held off. Finally we decided it was time to hoist and just as I got the spinnaker hooked up a wind line moved towards us and everyones spinnakers backwinded. The light southerly has arrive way early it was only around 1pm. As we sat their trying to make 4 knots of boat speed a whale surfaced next to us several times – beautiful. We beat till 5pm and dialed all the buoys to get real time conditions every one was showing southerlies less than 10 knots of wind. The crew made a decision it was time to go home – there were better things to do than drift offshore for 4 days. We hoisted the kite and to really show us how much it sucked that wouldn’t even set so it was time for the engine. We motored until we had 10 knots of wind and then hoisted the kite and sailed into a fog bank with about 200m visibility. When we sailed under the bridge you could hardly make out the underside of the roadway. We crossed in front of a container ship sailing at 10 knots missing it by about 250 meters and emerged into a beautiful sunset off coastguard point (sausalito). By the time we got back to the dock, cleaned up the boat and ate dinner it was 11pm. It is 5pm on Saturday 55 hours after the start and two boats have finished and 5 are still racing. The Beneteau 42 is bringing up the back and is only 140 miles down the track with 137 straight line distance left to go…… I went Friday night racing last night instead with the Fennell family on Good and Plenty and had a good time doing foredeck.Back to making some bags. 1)mast shadowing – where ever it is mounted there is typically a 10 degree blind spot aft of the mast if it is mounted on the front. With movement of the vessel however, the return will be pretty consistent of at least 5 miles. 2)Material – some materials absorb (fiberglass absorbs 50% of the beam) others like steel and aluminum reflect even if there is some reflection it might be so erratic that it can”t be monitored on the screen. 3)Standards – 10 m2 is minimum in US reflectors must show range of 4 nm in calm sea. The above test results were obtained at QinetiQ (DERA) in April/November 2001 and May 2002. 7: Try to keep it vertical so if you are sailing and heeled over have two down lines one on each toe rail and you can use these to counter the heel to some extent. If you think about having a reef in you should have one in. 9 out of 10 times you are faster with it in than heeling over and going sideways. * single lineÂ reefing – good for short handed sailing but I agree it doesn’t allow great foot control. * flattening reef (no change at the tack just takes a segment out by having a cringle on the leech)- some of the moore 24’s and express 27’s use them. Haven’t seen any on large offshore boats recently. 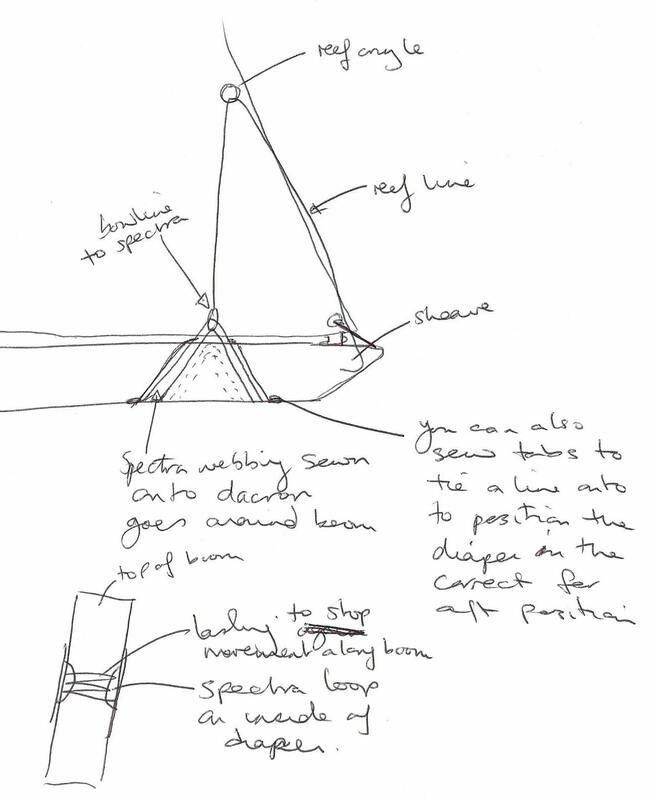 * slab reefingÂ – I prefer this but I like to go with the more expensive approach of tylaska’s on a spectra strop attached to the pad eye on the side of the mast. You attach the tylaska to a ring which is sewn into the luff of the main. The advantage of this is that you don’t have to worry about the ring dropping off the horns at the mast especially if you are moving your cunningham after the reef has been put in. It is really important to have the strop at the right length so that you don’t mess with the tack set back as this can cause havoc with the groove in the rig. Last year I had a goove fail on a carbon rig when the strop was a inch too long – expensive mistake there were other things going on but that helped to exasebate (spelling!) the problem. *reefing diapers – I use these on any booms where I am worried about the crush effect of wrapping a line around the boom. Also they mean you don’t have to worry about the placement of the reefing line along the boom. I don’t have a picture but imagine a piece of dacron in a diamond shape then sew on a piece of spectra webbing that follows the shape of the diamond with the join in the middle of the diamond and two loops extending from two opposite corners of the diamond. Then another piece of webbing on the inside which has loops that don’t extend beyond the material. You lash the diaper onto the boom using spectra laced through the loops of the shorter webbing – this allows you to put it in the correct position. You then attach the reef line to the loops that extend from the material. *reefing cringles – I don’t believe it is ever good to tie up the extra material by going through the cringles and around the boom. The reason for this is if either your tack or clew blow you have a large chance of ripping the sail as the weight will be on the cringles. Also if it is dark and someone forgets to untie one you don’t have the same result. When you tie the bundle up if you have a loose footed main put the sail tie between the sail and the boom so if a tack or clew blows you just have a sausage foot blowing around. Also when I worked as a sailmaker they use to sew webbing with a loop in it onto a round piece of material than glue that to the sail creating a weak link whereby the loop or patch would fail before the sail would fail. – Â illumination at night in the case of a man over board but they destroy your night vision. On my boats when going offshore I keep one flare velcroed to the handholds either side of the companionway so that if I need one quickly I just have to reach inside the companionway.